AR: My parents held 1960s values. They were free spirits, educated and open humanitarians who valued folk culture. My father moved to Greece in 1962. The mentality and culture in 1980s Greece reflected 1960s Western Europe: unspoiled and carefree. This was a time when the art world had more universal meaning and depth – before the mass market idea had really taken over. My values are rooted in this time and these memories. 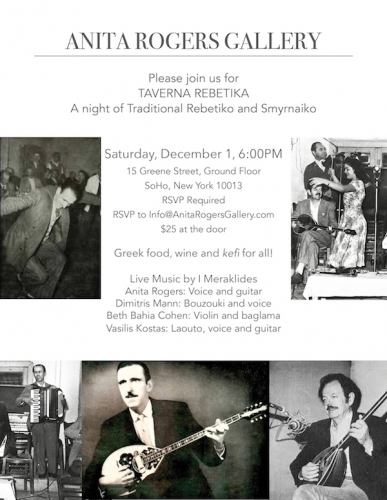 Please join us for TAVERNA REBETIKA, a night of Traditional Rebetiko and Smyrnaiko music hosted by Anita Rogers Gallery in SoHo on December 1st, 2018. Greek food, wine and kefi for all! $20 online before 12/1. $25 at the door. Young Space: What ideas are you exploring in your practice? 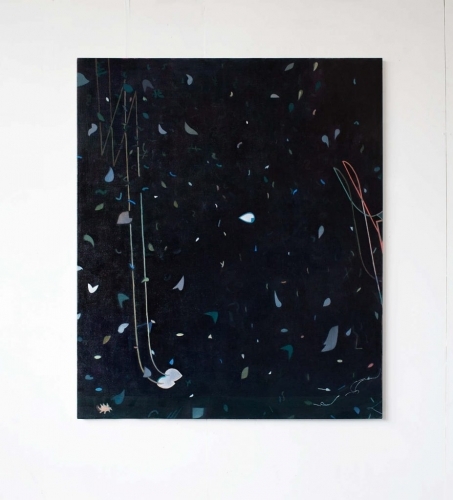 Tristan Barlow: My paintings are a mix of ideas that have built up over the years. I have a very strong relationship to art history, old Italian masters of the quattrocento, and the romanticism of ideas concerning space, ruminations of old teachers that have bounced around in my head and turned themselves into mythology. Though my paintings are, for the most part, “abstract,” I think of them more as an arena of spatial possibilities where the confluence of ideas is transformed into a visual language of symbols. 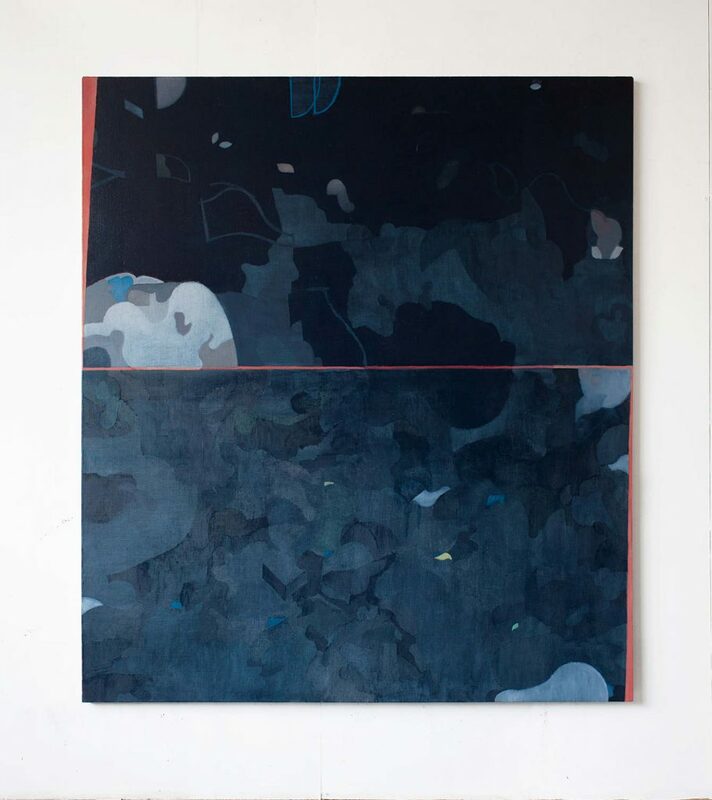 Mark-making, layers, pigment, and a willing suspension of disbelief concerning the impossibilities of space lends itself to a world of visual fictions. YS: What is your process like? Visually, my process is a filtering of ideas and notions from all sorts of sources. The idea of a mirrored image and Narcissus can send me through 20 paintings. So can a trip to the British museum or the light from a beach in Florida. Or what it would be like if Botecelli were to make a whole painting of grass and flowers? What if the Ancient Egyptians had internet? YS: Do you have a mentor, or a piece of advice (or both), which has influenced your practice? TB: My first professor in Mississippi, who I must give a lot of credit to, told me, “Son, in this business you gotta fish or cut bait.” That, inexplicably, has come back to mind many a time. 195 Chrystie Street Gallery, NYC (Lower East Side), Location of the 129th Annual Members’ Exhibition. The National Association of Women Artists is honored to present its 129th Annual Members’ Exhibition, a show of paintings, works on paper, sculpture, mixed media, photography, and collage by established member artists. This year, the exhibit will be held at 195 Chrystie Street in the artistic heart of New York’s Lower East Side. For two weeks, members’ artworks will be on displayed 7 days of the week, just a heartbeat away from the New Museum of Contemporary Art, the International Center for Photography, the celebrated Tenement Museum and many other galleries and restaurants ideal for the gallery-going public. The Annual Member’s Exhibition continues NAWA’s long history of nurturing and inspiring talented, visionary and dynamic women artists from throughout the United States. NAWA was founded in 1889 by five brave and innovative women who were barred from full participation in the male-dominated National Academy of Design and the Society of American Artists. Early exhibitions included works by Mary Cassatt, Suzanne Valadon among others and as the roster grew, Gertrude Vanderbilt Whitney, Louise Nevelson and Alice Neel became noted member luminaries. NAWA’s existence is a testament to the integral and essential role of women in the art world. NAWA’s president, Jill Cliffer Baratta, will be hosting the opening reception and award ceremony from 6:00 – 9:00 pm. on Thursday, October 11, 2018, with over $10,000 in awards. This year’s lineup of jurors is an impressive one—a distinguished painter-writer-teacher, a SoHo gallery owner and a senior curator for the Brooklyn Museum. All programming is free & open to the public. Jennifer Famery-Mariani, Director and Chief Curator of TAC Night launched the festival in 2016. 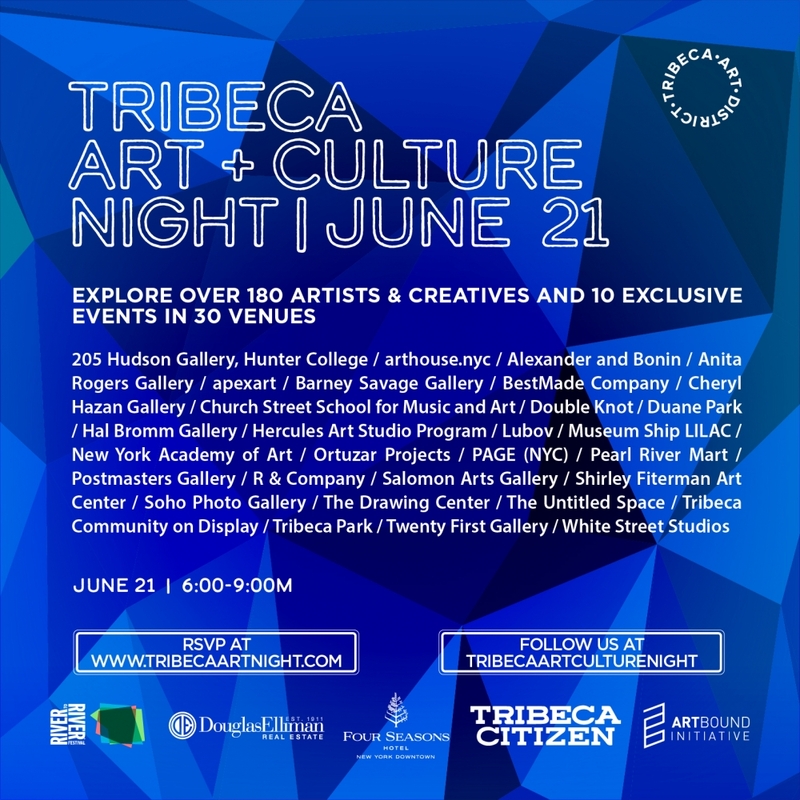 Tribeca is the place to be on Thursday, June 21, 2018 when the New York City neighborhood hosts the Spring edition of Tribeca Art & Culture Night (TAC Night). Offered four times a year, TAC Night features art performance, dance, artist tours, gallery talks, open studios, workshops and more taking place across the Downtown New York neighborhood. Tribeca has a concentration of around 50 art and design galleries along with schools, non-profits, performance art centers, craft makers and more, according to TAC Night’s website. TAC Nights help draw attention to the creative and art concentration by drawing the neighborhood together and offering a formalized slate of gallery tours, performances and special events that can take place inside venues or in the streets. The spring edition features around 30 venues and partner organizations. 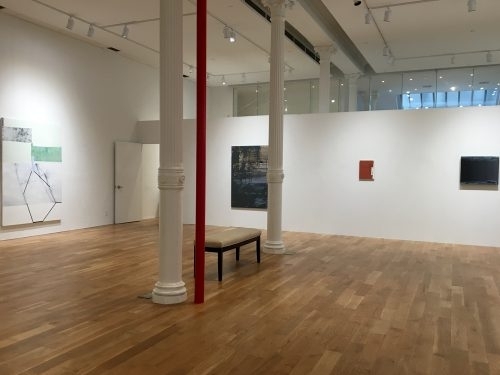 Participant galleries include 205 Hudson Gallery at Hunter College; Alexander and Bonin; Anita Rogers Gallery; apexart; Cheryl Hazan Gallery; Hal Bromm Gallery; Lubov Gallery; Ortuzar Projects; Postmasters Gallery; The Drawing Center; The Untitled Space and others. Performance and live arts helps to make the evening a special one. There are no fewer than 40 special events that include workshops, live music, poetry readings, play writing, dance, exhibition tours, artist talks, collecting insights, feng shey of carpet colors and shapes and much more. Tribeca Art & Culture Night can be experiences several ways. Participants can sign up for guided tours with an art specialists or register for a TAC Night Pass to experience the evening as a free spirit. Reservations for exclusive events can also be accomplished through the website. Click here to begin. In addition, maps can be found at participating venues. NEW YORK, NY.- Anita Rogers Gallery is presenting Summer Group Exhibition I featuring drawings by Jack Martin Rogers and sculpture by Mark Webber. 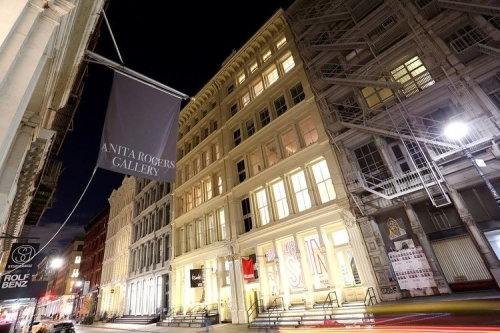 The exhibition is on view June 6 – July 14 at 15 Greene Street in SoHo, New York. Jack Martin Rogers was born in Warwic kshire, UK in 1945. He studied anatomy and fine art at the Birmingham School of Art. He moved to the island of Crete in Greece in 1962, which is when he began painting his most prolific work. Rogers went through many stylistic periods, ranging from fully figurative to abstract. He died in 2001, leaving behind an extraordinary body of work. Seventy-five percent of his estate is owned by his daughter, Anita Rogers. Webber resides in Sag Harbor, NY where he has worked as a cabinetmaker for many years. There he learned the craft of making objects and put in his time to develop that ability. Webber studied under Charles Ginnever and Peter Forakis at Windham College in Vermont. He received a BFA in sculpture at SUNY, Purchase. He has exhibited at many galleries in the Hamptons and is in several private collections on the East Coast.